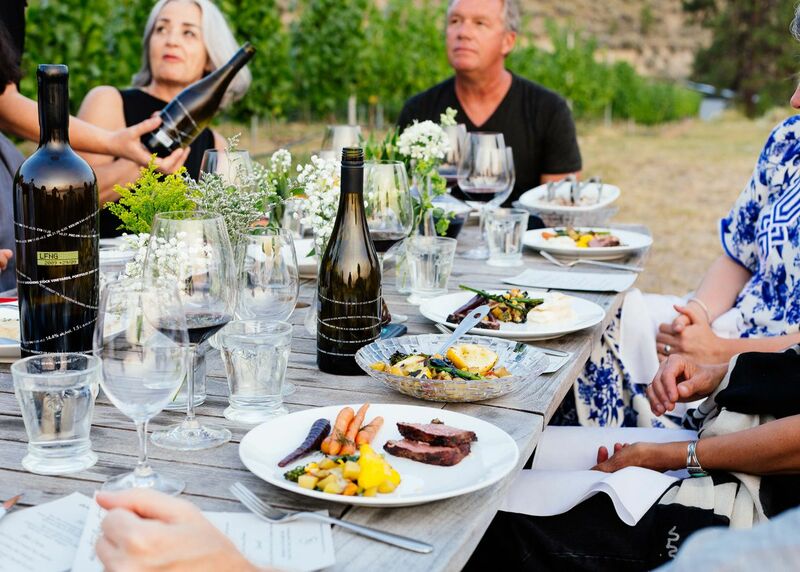 Food & Wine What makes Naramata Bench wines so special? What makes Naramata Bench wines so special? The grounds of David and Cynthia Enns' Naramata, B.C., home are bordered with lavender and old-growth sage. 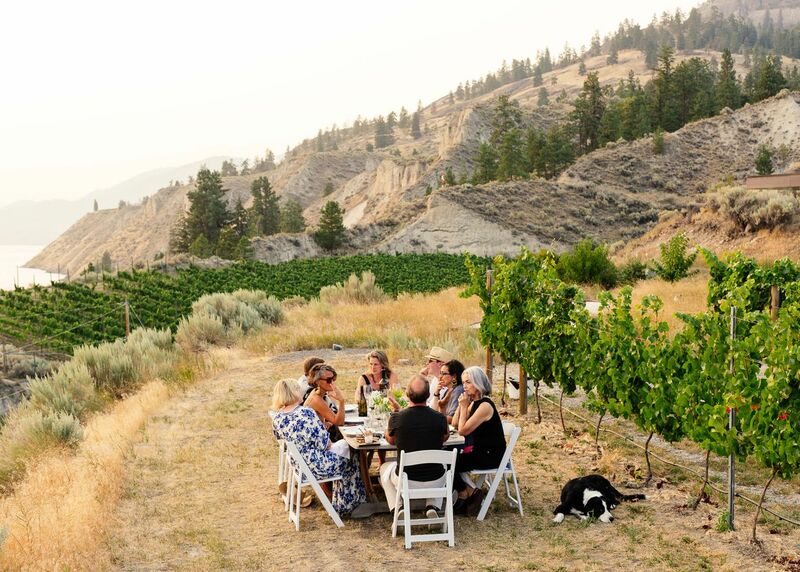 On a midsummer night, with the evening temperature still well above 30 degrees, the hardy herbs perfume the breeze and infuse the pinot noir vineyard in their front yard with an earthiness that’s well-known to oenophiles who favour the Okanagan Valley’s vintages. The Ennses maintain this plot for their premium wine label, Laughing Stock, but tonight it will also serve as the backdrop for a dinner for friends of the winery. A late-July gathering like this is a rare, brief moment when the winemakers can exhale. ''All the work that goes into the vineyard has been done,'' says Cynthia. ''You're just waiting for the vineyard to ripen as you start prepping for harvest.'' In many ways, that description captures the journey she and her husband have been on since launching Laughing Stock in 2003, when they left behind successful careers in finance to invest in the development of structured, Bordeaux-inspired reds. 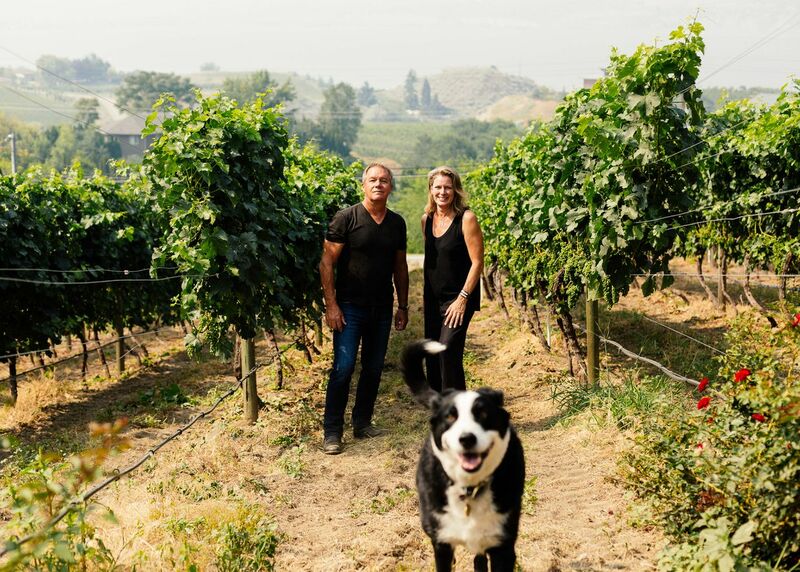 Last fall, Canadian-owned wine producer and marketer Arterra Wines Canada, which oversees big players such as Jackson-Triggs and boutique brands like Nk'Mip Cellars, acquired the winery, keeping the couple on board to lead the business. 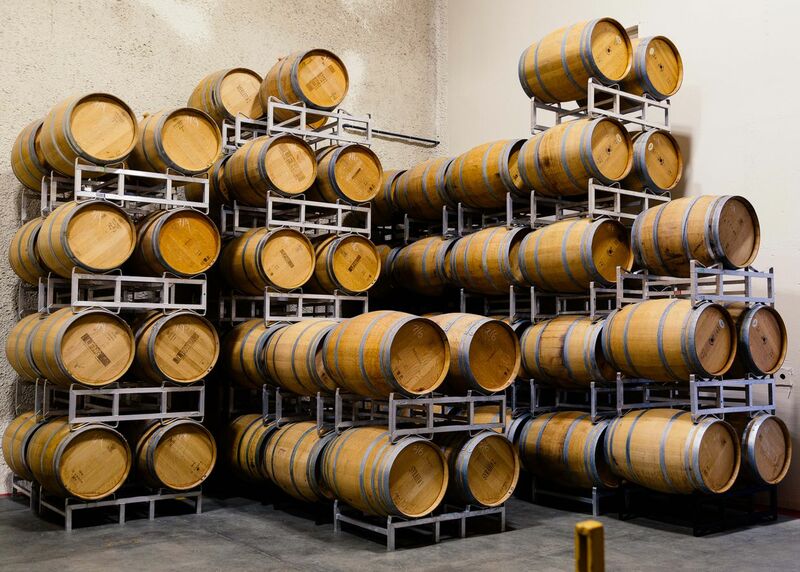 As part of their management and winemaking efforts, the Ennses are involved in an application currently before the Vintner’s Quality Alliance to establish a new, legally defined sub-geographic indicator specifically for wine made from Naramata Bench grapes. While the VQA designation is based on factors such as soil, climate and natural surroundings (a.k.a. 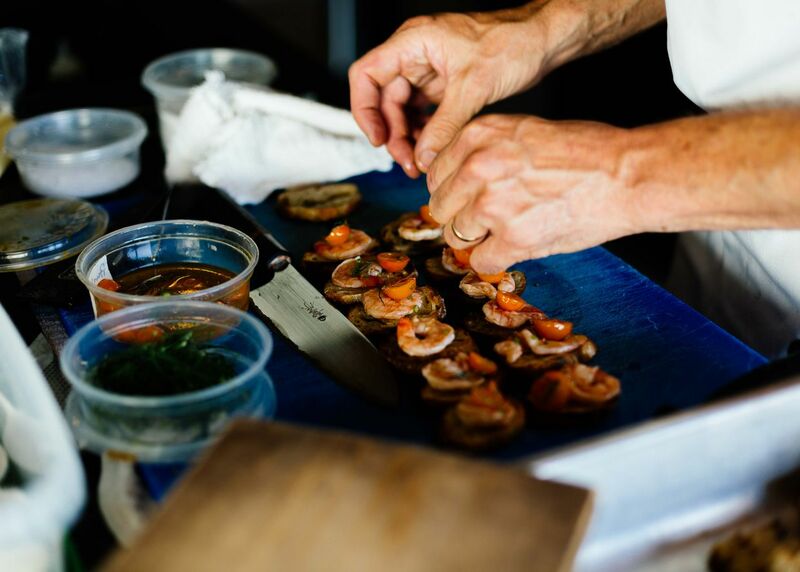 terroir), there’s no question that a region’s way of life and creative spirit also contribute to what makes it distinct. It’s that balance between meticulous cultivation and local culture that the dinner-party guests will toast with bottle after bottle this evening. David and Cynthia Enns, with their dog, Radar. 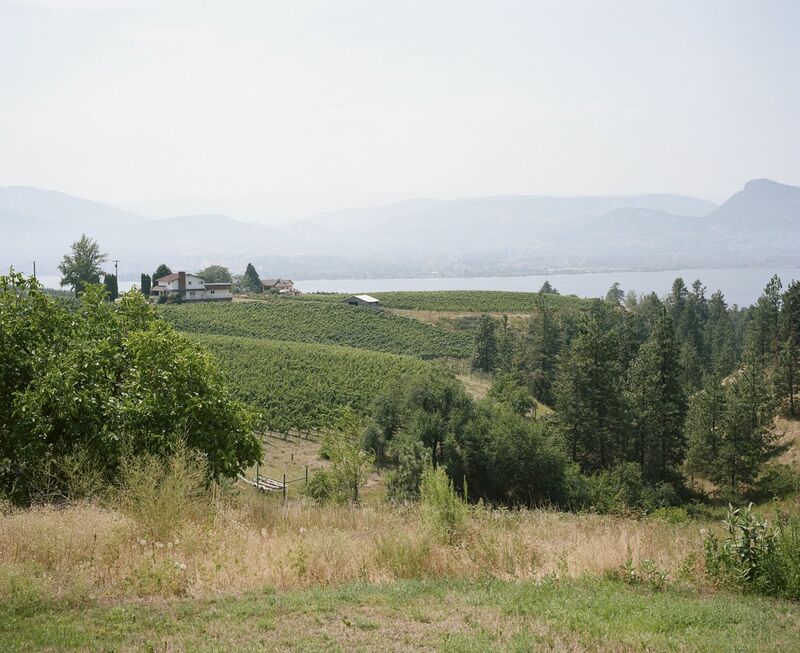 It’s hard to adequately describe the Okanagan Valley’s breathtaking beauty, its landscape layered with lakeshore, clay bluffs, vineyards, orchards and scruffy desert wilderness. The Naramata Bench, a roughly 19-kilometre stretch on the eastern shore of Lake Okanagan just north of Penticton, is centred around the beachy town founded in 1907 by rancher and prospector John Moore Robinson, who planted some of the area’s first orchards. Over a century later, summer fruit stands along the sinuous Naramata Road overflow as crews finish picking the season's sun-bathed peach and cherry bounty. Vineyards drape over the hillsides and sweeping views appear around every curve. Up a discreet driveway is the site where David and Cynthia founded Laughing Stock 15 years ago. As the story goes, the winery’s name reflects the skepticism of the couple’s friends when they left the corporate world to make wine. Well, they did not completely leave it behind: Since its inception, Laughing Stock’s bottles have been branded with stock tickers that feature the closing price of TSX listed companies on the date that vintage’s grapes were picked. Its wine names also play on financial terms. The very first wine the Ennses created is called Portfolio, and it remains the winery’s award-winning flagship. Next came Blind Trust, with a blend that changes every year at the vintner’s discretion – and isn’t revealed until a customer buys the wine and peels back the wrapping on the bottle’s neck to reveal its mix of varietals. A hazy summer afternoon on Okanagan Lake is perfect for photo opps. Egg-shaped concrete fermenters are labelled with nicknames, such as Benedict. On a mezzanine overlooking the building’s stainless-steel vats, there is an area Cynthia dubs ''the playground.'' 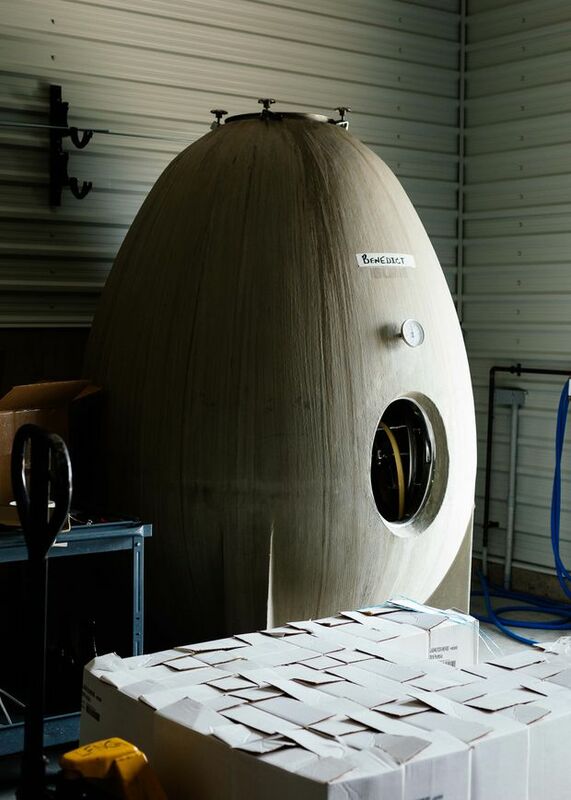 A few egg-shaped concrete fermenters bear strips of masking tape marked with nicknames like Fabergé, Scrambled and Benedict. These well-insulated vessels help maintain temperature as the liquid ages, to produce a more consistent wine. There are also terracotta amphorae, traditional clay vessels. David has been using the ancient winemaking technique for several years on limitedproduction blends, like bottles of plush Laughing Stock Amphora Syrah. As a result of the Arterra purchase, a modest expansion of the winery building is underway. The expanded space will accommodate additional equipment to allow Laughing Stock to handle its estimated 200-tonne harvest this fall (up from last year’s 140) and satisfy growing customer demand. ''We did 2,500 cases of Portfolio and we sold our last case yesterday,'' says David. The next Portfolio, a 2018 vintage, will be released Oct. 1. 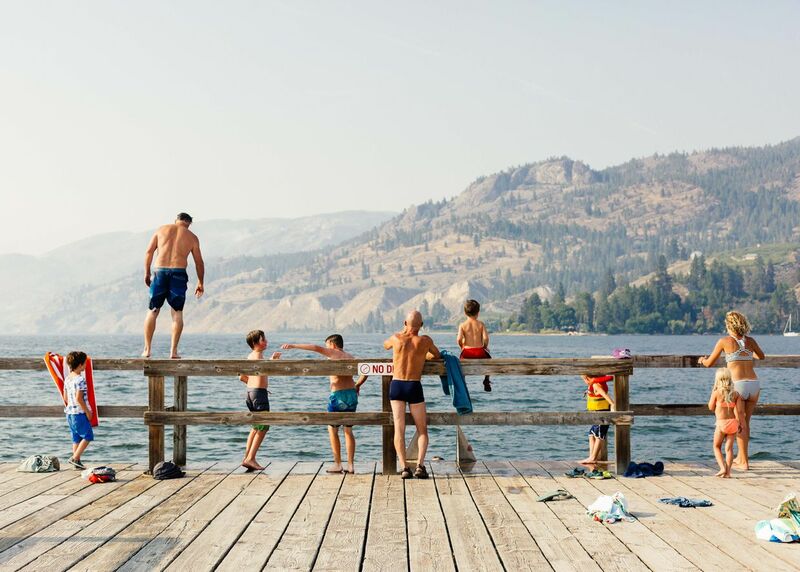 Life in Naramata during the summer revolves around the annual cherry-pit spitting contest in Wharf Park (above), jumping off the town dock, as well as fruit harvests and the weekly community market. Despite the growing notoriety of its wine business, Naramata’s most famous resident is an elusive wild peacock that wanders the village. The day before the winemakers' dinner, and with some time to play tourist in their own backyard, the Ennses join me for lunch at local café, The Grape Leaf, where we can hear the bird calling out beyond the fence that surrounds the eatery’s back patio. 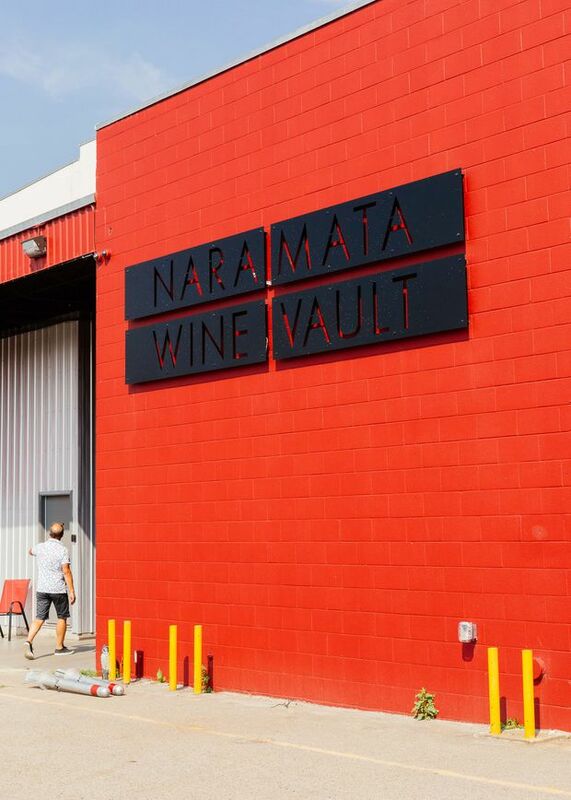 The village is also home to David’s latest venture, the Naramata Wine Vault, a new cold storage facility developed by him and a few partners on the site of an abandoned B.C. fruit-packing warehouse. The new Naramata Wine Vault stores barrels and bottles in the centre of the village. 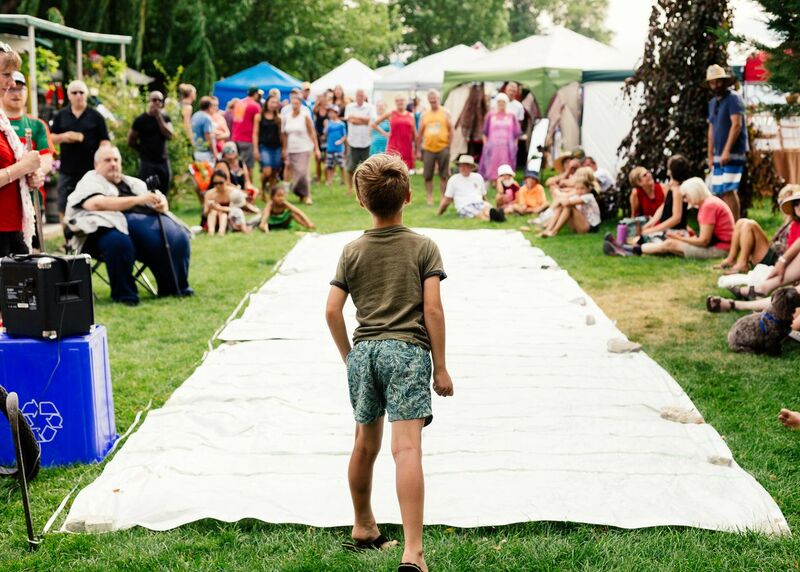 The vault anchors the town centre on the edge of Wharf Park where the Naramata Community Market sets up every Wednesday throughout the growing season. 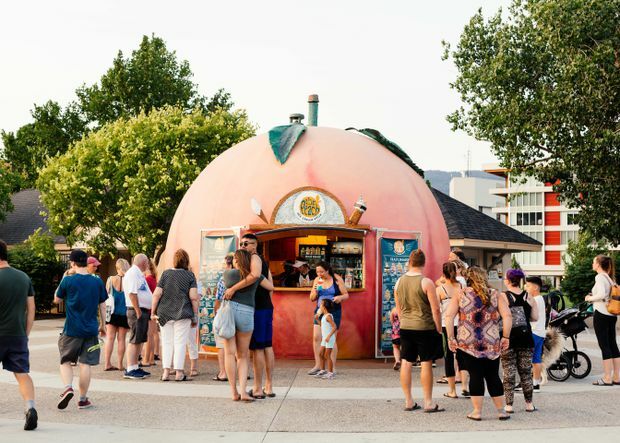 Playing hooky today means there’s time to peruse the eclectic vendor stalls of mushrooms, wildflowers and hula hoops, and sample the area’s dessert specialty, the galette, a handshaped pastry laden with seasonal fruit. By the end of the day, we’ve cheered on competitors in Naramata’s annual cherry-pit spitting contest (the current distance record is 35 feet) and I’ve jumped into the cool lake water from the old ferry dock with the locals. As they were establishing their business, David and Cynthia lived on the winery property, raising their son Joshua, now 19, in the adjacent private house. Today, that home is where Laughing Stock’s winemaker keeps close watch on the property’s five Bordeaux varietal vines during harvest season, and the Ennses have moved 15 minutes up the road to a sleek house built at the top of a waterfront cliff with their nine-year-old Border Collie Bernese Mountain Dog, Radar. 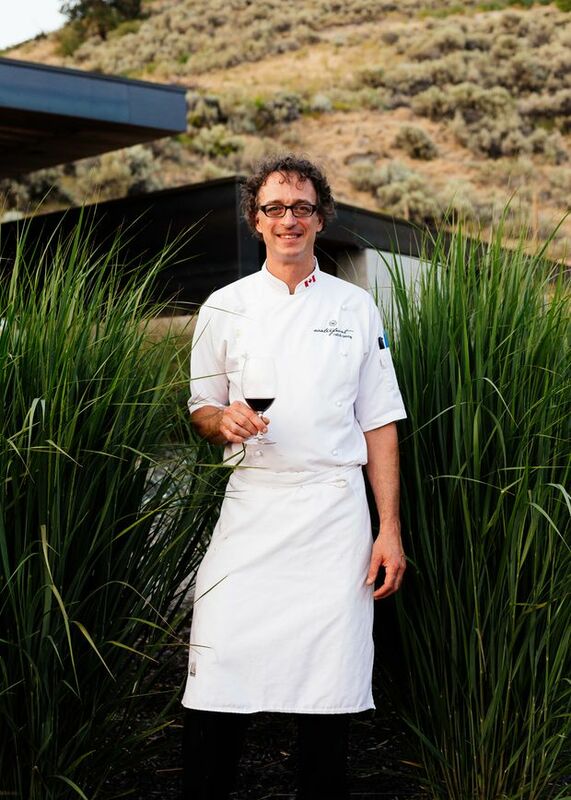 Chef Mark Filatow helms Kelowna’s Waterfront Wines restaurant and is a member of the Sommelier Guild. It’s here that friends start to arrive for dinner, travelling from Penticton, Kelowna, Vancouver and Calgary. Chef Mark Filatow of Kelowna’s Waterfront Wines restaurant is in the kitchen, and as one of the few chefs in Canada who is also in the Sommelier Guild, he is uniquely qualified to cook up a dinner menu that simultaneously showcases Laughing Stock wine and B.C. cuisine. In addition to the 2016 Amphora Syrah, the Ennses will serve their 2017 Pinot Gris, a 2015 Pinot Noir and a magnum of 2009 Portfolio. Filatow’s contribution includes field-raised cattle striploin from a nearby ranch, Cache Creek, that’s been dry-aged 40 days, and a salad accented with local apricots and Okanagan chèvre. Sipping a 2017 Viognier over canapés including spiced tuna on rice crisps and prawn escabeche with dill, a few guests linger inside the house in front of an abstract oil painting by Vancouver artist Carla Tak. It's a rare treat that the artist herself is present. Tak has been visiting friends in the area for decades and lived in California in the 1970s; she likens Naramata's flourishing wine culture to her experience of the Napa Valley as it was hitting the limelight thanks to the efforts of Robert Mondavi. Filatow's dishes included included prawn escabeche. The dinner table was set between the vines and lake at the couple's home. Actor Emily Holmes, who appeared in Amazon Studios' The Man in the High Castle, just relocated her young family from Vancouver to Kelowna and, from across the table, she is praising the virtues of this quality of life and how much winemaking determines the rhythm of the local social calendar. ''Friends who work in wine, you don’t see them during crush – until they come out the other side, exhausted,'' she says with a chuckle. Virginia Bray, the stylish owner of Penticton fashion boutique Ad Hoc, adds with a laugh that there’s ''definitely a seasonal gumboot phase'' that disrupts her local customers' otherwise airy and artfully draped wardrobes. Architect Chris Allen says he finds balance by taking his kids for a predinner swim in the lake most nights. Allen is the principal at Landform Architecture + Design Build and has designed many award-winning food, wine and residential projects in the area. He is currently working on the mirror-clad Osoyoos Larose winery building that France’s Groupe Taillan (owner of Bordeaux’s historic Château Gruaud-Larose estate) is slated to open next spring, 90 minutes south of Naramata on the border of B.C. and Washington. Talk turns to the natural evolution of the Okanagan’s success and the outside investment that comes with growing attention. Bray points out how many of those gathered at the table – the architect, the shopkeeper, the actor and the oenophiles – idealistically arrived in the Okanagan ''with a hare-brained scheme'' to do what they love and have ended up shaping the culture and reputation of the region and its legacy. As Cynthia pours yet another vintage from her wine library, there’s an appreciative silence as everyone ponders this. In the distance, the shimmering lake is reflecting a golden pink sunset straight out of a Maxfield Parrish painting. Barrels inside the Naramata Wine Vault belong to Laughing Stock and a group of other local vintners. Landform Architecture + Design Build’s Chris Allen focuses his work on natural materials and preserving native landscapes. His projects include the Okanagan Valley’s most striking private homes, public spaces and the Naramata Wine Vault. Vancouver artist Carla Tak rediscovered painting at 50, translating an interest in psychology into textural works in oil and acrylic. In addition to her own studio, her work is available via galleries in Los Angeles and Palm Springs. 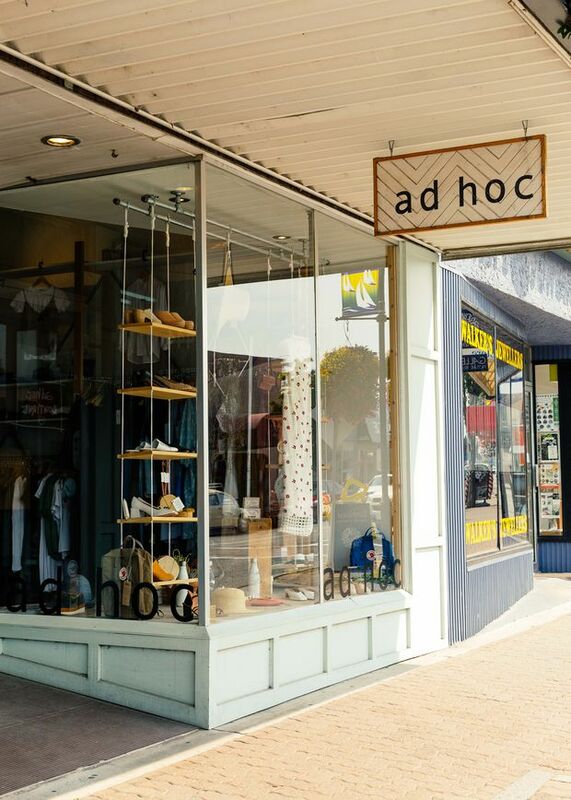 The owner of Penticton’s Ad Hoc Boutique, Virginia Bray sells a mix of independent labels including many made-in-Canada brands like Eliza Faulkner, Valerie Dumaine, The Stowe and Erin Templeton. A recent transplant from Vancouver to the Okanagan, actor Emily Holmes' film and television credits include Snakes on a Plane, Battlestar Galactica, Smallville and the Amazon series The Man in the High Castle. Based in Calgary, Brad Royale is the wine director for Canadian Rocky Mountain Resorts. David Enns has collaborated on Royale’s micro wine label, Kittenswish, which highlights partnerships with winemakers around the world. 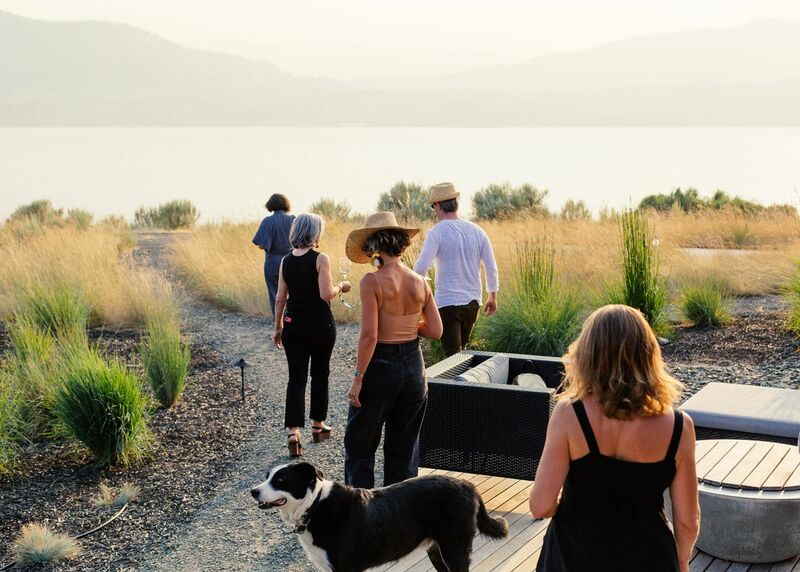 Nathalie Atkinson travelled to the Okanagan as a guest of Destination British Columbia, Arterra Wines Canada and Penticton Lakeside Resort & Conference Centre . The companies did not review or approve this article prior to publication.